It's a beautiful thing to feel genuinely cared for and listened to. I met with Dr. Samantha for the first time today and feel so much gratitude for her and her practice. Today marks the day I make the decision to act on my health, rather than passively stand by and let the (tortilla) chips fall where they may. It's a decision I will make everyday for the rest of my life, but I now feel like I have a dedicated professional, caregiver, guide alongside this journey. You have such a gift and a beautiful heart, Dr. Samantha. Thank you. C.S. For me it takes both a gifted healer, as well as a person strong enough to tell me the truth about what they see, to help cure my ills. I have found that person in Samantha Brody. It’s been a journey – she doesn’t have a little pill that makes me healthy – but she has become my strongest ally in living a healthy life. Plus, she makes me laugh! I can’t thank her enough. M.D. I consider myself a relatively healthy person living a healthy lifestyle, but I had nagging problems like irregularity and acne. I also have a dairy allergy, and didn't like that my doctor's advice about dealing with it was, "Oh just take some calcium pills." I had tried naturopaths before, but always got a weird vibe and they never made me feel comfortable thinking of them as a doctor. One day when I was venting my frustration, a friend recommended that I see Dr. Samantha. I am SO glad I did. She has developed a plan that successfully addresses each issue in a way that isn't at the expense of another. I had never experienced that before. She is exactly what I think a doctor should be: intelligent, extremely detail oriented, open minded about treatment methods, and focused on how all of my issues interact. I only wish I found her sooner! T.D. "Dr. Samantha is an honest, caring, never-let-you-quit force that I welcome into my life. I have been seeking her advice for about 2 years. She has successfully addressed 25 years of medical issues that no other doctor could. Her level of patience with my resistance to change has been awesome. Her “baby step” process for me has addressed: thyroid, nutrition, celiac, weight, muscle, and so much more. As I have become healthier I was able to identify issues with my daughter. As she is away at college, she was able to do virtual consultations with Dr. Samantha. This has been the perfect tool for my daughter for all of the environmental & nutritional challenges she faces at college. I am confident that she is getting the type of care that she needs. I am very grateful for so many positive results for both of us." T.B. "I grew up in an environment where natural medicine was considered a subjective fad. Last year, my views were transformed through my experience with Dr. Brody..."
I was referred to her when I was about to have surgery to open my nasal passages as a last resort to solve an exhaustion problem. I work at home and was so tired I felt like sleeping all day – the previous year I’d actually slept an entire week. My family practice doctor recommended exercise and Lipitor (my cholesterol was 270, and weight was 250 on a 6’ frame). Neither seemed like they would really solve the problem. I thought I was not getting enough oxygen so I went to an ENT who was more than happy to give me an MRI that showed some sinus blockage. Surgery was promptly scheduled. I tried some aromatherapy at Aequis to see if I could open my airways a bit more in the meantime. During my visit the therapist there referred me to Dr. Brody. In the first few minutes of meeting me, Dr. Brody performed a simple test that scientifically demonstrated I did not have an oxygen level problem, and that surgery might not solve my issues. She proceeded to test me for a variety of things, including a sleep study, and worked with me to change the nature of what I was eating to ensure my body had the nutrients it required. I never ate much but was overweight for years. With her recommendations for diet and nutritional supplements my body changed. Within six months, I lost 50lbs without exercise (not her idea believe me, she wants me to), my cholesterol dropped 110 points, and I'm no longer tired all the time. This did not require surgery or pharmaceuticals. Dr. Brody is sharp, funny, warm-hearted, and intelligent. She doesn’t discount the value of western medicine, but teaches you about your body and it’s requirements in a logical, supportive way that helps you effect change for yourself. I can’t tell you what a renovation my life has undergone in the past 18 months. Oh, and I have started exercising. 🙂 D.S. I was referred to Dr. Brody by my primary care physician, after exhausting considerable resources trying to manage the worst health issues I have ever experienced in nearly 40 years. In the previous 7 months, I had gone from being in the best shape of my life, to losing over 35 lbs. and being on the edge of complete physical and mental collapse. My symptoms consisted of chronic pain, insomnia, lack of focus and concentration as well as not being able to eat what seemed to be much if any food at all. In other words, I was literally starving to death. From my first meeting with her, I knew I was in business. Dr. Brody's approach is straight up. She never once told me what she thought I wanted to hear or a glossy version of some far fetched diagnosis. But rather the truth, and what we could do about my situation. I have excellent instincts when it comes to reading people. And I trusted her immediately. From day one, she got right to work. Gave me a regimen. Direction. Testing. Insight. Care.... So dedicated and resolute she was, taking time to not just hear what I had to say, but listen. Going the extra mile. Taking the time, but wasting none. Treating the symptoms as well as the individual. Healing. Even though I was in very rough shape, within a few weeks I could begin to see and feel the results. Which were dramatic given the severity of what I was going through. I knew she had me on the right track and I hung on, with complete faith that she would not give up on me, or steer me in the wrong direction. By the time spring had come around, I was really getting back my stride. Racing season was coming up, and Dr. Brody made sure that I would be ready to go. If you want a prescription, go to any doctor. If you want your quality of life back, make an appointment with Dr. Brody. Without a doubt, one of the most skilled and sincere individuals I have ever met. It is unlikely I would be here to write this if it wasn't for her. D.R. I spent the better part of four years going from specialist to specialist trying to find a diagnosis for my varied and seeming unrelated medical symptoms (pelvic pain, eye swelling, frequent periods, sweating, facial numbness). I came to Dr. Brody through a friend's recommendation, hoping she could just recommend some daily supplements to keep me as healthy as possible. During our initial visit, Dr. Brody immediately suspected that food sensitivities might be the source of some of my problems, a theory that had never been considered by any MD I had seen. After following the elimination diet she suggested, it was obvious that certain foods were triggering many of my problems. Under her guidance, I started the dietary changes she recommended, along with nutritional supplements and acupuncture for additional support. A year later, all of my symptoms have been eliminated or drastically reduced. I'm convinced that without her help, I'd still be wandering the medical centers of Portland looking for answers. L.R. Before I saw Dr. Brody I had anxiety, panic attacks, mild depression, and extreme fatigue. I didn’t know where to begin to feel better. Since seeing her my symptoms have all but disappeared. Simple tasks no longer feel daunting and I am able to lead a productive life. Dr. Brody is thorough, consistent, intelligent, compassionate, and supportive. She also encourages me to be an active part in my own healthcare, which empowers me everyday. She is the best doctor I have ever had. E.S. I have been a patient of Dr. Samantha's for several years, seeing her for annual check-ups, nutrition and weight management, as well as day-to-day issues including colds and flu. 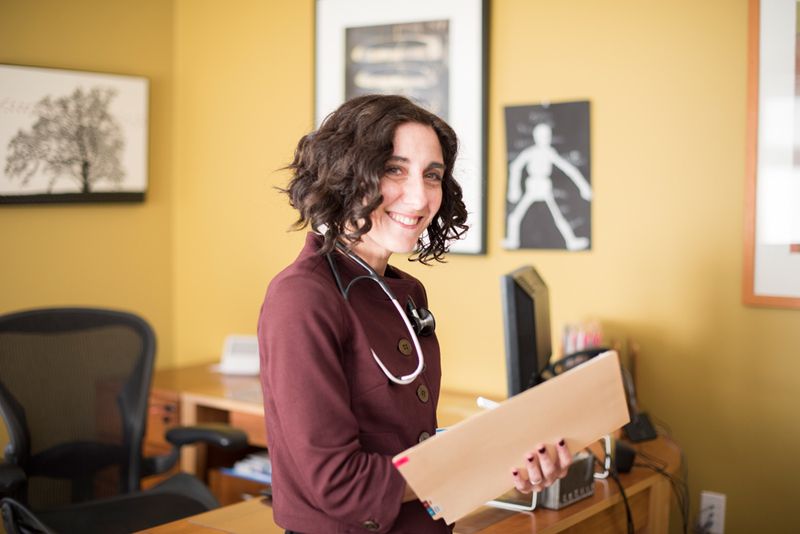 Without a doubt, she is highly knowledgeable about both naturopathy and acupuncture. She listens to me, and understands whatever complaint I have in terms of who I am as a whole person and how previous health and life events affect who I am today. I especially respect the fact that Dr. Samantha doesn't insist I continually see her, and doesn't hesitate to refer me to a specialist when necessary. I have recommended her to a number of friends and will continue to do so. S.T. I'd had a variety of headaches and stomach problems for months when I finally went to see Dr. Brody. She was very thorough and used mainstream medical diagnostic tests to rule out my worst worries, and then addressed my symptoms with acupuncture and naturopathy. I appreciated her forthrightness, her kindness, and her willingness to consider a wide range of options for the most appropriate course of action. L.M. Dr. Brody has been my doctor for a couple years. She surprised me by somehow getting me to follow her advice! Others have failed - she succeeded. I think this is a really important point. I am now taking much better care of myself and consequently feel much better. First, she knew what she was doing and therefore had good advice. Second, I was able to follow her advice even when I'd ignored other doctor's suggestions. One simple example: I changed my eating habits, which I had thought was just not possible, and now feel and look better. And, best of all, I'm enjoying what I eat even more (ah, variety, the spice of life). Her methods are still a mystery to me. If I don't follow her advice right away she does not make me feel bad in any way with her reactions (thus I'm comfortable speaking up about what I do or don't do). She just seems to care. And maybe that is the key! J.K. I don’t know if there is a typical patient for naturopathic treatment or acupuncture, but as a natural skeptic, I was pretty sure it wasn’t me. Now, two and a half months after my first visit, my energy is better than it’s been in years. My immune system seems strong, and despite a stressful work environment my demeanor has become downright cheerful. I’ve even lost a few pounds. In the three months prior to my first appointment with Dr. Brody, I had grown desperate about my health, lurching from one virus to the next, with a continuous feeling of fatigue. This was a pattern that I’d seen repeated through the last several years, becoming slightly worse over time. This year in particular, my job could not afford suboptimal performance, much less my absence. On top of that, I was sick of feeling lousy. When my primary care physician at Kaiser recommended I see a Naturopath, I swallowed my skepticism and made the appointment. No magic pill was presented to fix my problems. Instead Dr. Brody directed a plan of action including changes to diet, dietary supplements, changes in my pattern of exercise, and eventually acupuncture (another opportunity to challenge my skepticism). My responsibility was simply to follow directions. To follow directions is not necessarily an easy thing, particularly when it involves change to habits like eating and exercise that have been in place for a long time. But I was determined to feel better. I didn’t get better overnight; at one point it was necessary to take a course of antibiotics. But I could feel the progress being made, evidenced by a quick rebound from a bacterial infection. At this writing, I’ve been completely well for a full month. It’s hard for me to say which variables have made the most difference: removing certain foods from my diet, adding dietary supplements, acupuncture, the attitude shift occurs when you start to take control of a situation. My guess is that it’s all of the above. In addition, Dr. Brody is sincere, professional and friendly, and I have come to look forward to my appointments, particularly acupuncture. Dr. Brody’s goal was not to make me feel as good as I felt before my cycle of viruses began. Her goal was to make me feel better than that. After less than three months, we’ve already achieved that goal. X.X. I suffered from a painful, stiff neck for nearly three years before I met Dr. Samantha Brody. I had seen three medical doctors, two chiropractors and had numerous massages, all without relief. Then, a friend suggested I attend a seminar on pain and inflammation being presented by a naturopathic physician. I listened to Dr. Brody's lecture and the next day made an appointment with her. At my first appointment I had to turn my chair so I could look at Dr. Brody. In less than one month I could turn my head and the pain had disappeared. I do not have words to describe the tremendous relief Dr. Brody gave me. I tell everyone about her miraculous CURE! T.R. Dr. Brody has fixed problems after suggestions by conventional doctors didn't work. I have three examples of that: When my ear was clogged up for a week, she showed me where to press on my estacian tube; when I was a week over my due date with my second baby, she told me what to take; and when I hurt my foot she got rid of the pain with acupuncture, (after a podiatrist could not fix it with a shot of steroids). She has an excellent understanding of how the body works and is always able to come up with a solution for whatever ails me. N.D. In the fall of 2002 I went to see Dr. Brody for the first time. I had made the decision to combine more traditional care with alternative options, after years of frustration with western medicine. With so many issues to address it was difficult to identify priorities and determine how and where to start. I was plagued with canker soars, stomach problems, and issues with periods. Through a holistic approach that included diet, supplements, exercise, and mind/body balance there has been significant improvements in my health and wealth being. After years of stomach problems – they have virtually disappeared. Those awful canker soars are now almost nonexistent. Periods are in check - and that was a huge and bothersome issue for me. I highly recommend Dr. Brody's approach, her availability to her patients, and the care she takes in individual and effective programs. A.W. I started going to Dr. Brody because I wanted one doctor that was knowledgeable with naturopathic medicine and acupuncture. Unlike traditional doctors, she takes time evaluating your situation to find the underlying cause rather than just the symptoms. Her expertise, professionalism, and direct approach are quite refreshing. P.C. Dr. Brody is always very sympathetic and takes time to really listen to every concern. I came in during one episode and was very nervous, irritable and edgy. She proscribed an herbal remedy that helped me within 15 minutes that I took it. I was back to my good-natured self in no time. L.T.